The Indian Gharial: Going, Going, Gone? After years of conservation activity and having been literally brought back from the brink of extinction, the Indian Gharial (Gavialis gangeticus) is in serious trouble yet again. The Indian Gharial (which derives its name from ghara, an earthen pot that resembles the bulbous nasal appendage present on mature males) with its characteristic elongate, narrow snout; is one of the two surviving members of the living fossil family Gavialidae. The species has a riverine habitat and is better adapted to an aquatic lifestyle in the calmer areas of deep, fast-moving rivers. It does not prefer land since it is poorly equipped for movement outside the water and leaves the water only to bask and to lay eggs. Consequently, it does not go further away and prefers to both bask and nest closer to the river on the sandbanks. Adults are exclusively fish eaters while the juveniles feed on smaller invertebrate and vertebrate prey such as insects and frogs, respectively. After evading extinction in the early 1970s, conservation programs brought them back from the brink. It was a great relief to everyone as the efforts seemed to be working and the gharial number went up. However, by 2005 it became clear that something had again gone wrong and in 2006 it was estimated that the wild gharial adult population had come down to less than 150. In 2007, the Indian Gharial became the only crocodile to be re-classified “Critically Endangered” (CR) by the International Union for the Conservation of Nature and Natural Resources (IUCN). The IUCN Red List put the number of breeding adult gharials in Nepal and India at 182. This was a clear decline of 58 % as the same figure a decade ago was 436. At the same time, the Chambal River seemed to be the gharial’s last stronghold. Clearly, the Indian Gharial did not seem to be having a good time. As if all of this wasn’t enough, the December of 2007 came as a shock to wildlife biologists, conservationists and to the Gharial Multi Task Force (GMTF) that wasset up in 2004 as an independent conservation organization with a multi-pronged approach to gharial conservation. While the Government count said 64, the Bombay Natural History Society (BNHS) declared that close to 100 gharials had died in the stretch of Chambal River across Madhya Pradesh in less than a month. With eyewitness reports suggesting suffocation to be the main cause, bodies of dead gharials were recovered from the river and were also seen lying on the sandbanks. It should be noted here that both wildlife experts and the media had been raising the issue of a vulnerable gharial population in the Chambal River since the beginning of last year. While Bahar Dutt, of CNN-IBN exposed the rampant illegal sand mining, a fraudulent Environmental Impact Assessment (EIA) report and the cases of illegal fishing and poaching in Chambal, wildlife biologists such as Mr. Faiyaz A. Khudsar of the University of Delhi have been warning about the rampant illegal fishing which brings the Indian Gharial (that exclusively feeds on fish) in direct conflict with the fishermen. Where are the gharials? An observed gharial nesting site near Rajghat in Morena on the banks of River Chambal in Madhya Pradesh. Mining the sandbank. Mr. Sitaram Tagore, a Research Scholar from Jiwaji University who is studying the impacts of sand mining on the banks of the Chambal River informs that while the people who carry out sand mining activity have no intention of killing the gharials, any gharial that comes in their way is not spared. Also, the very sand that is mined overlaps with the habitat and the nesting sites of the gharials. 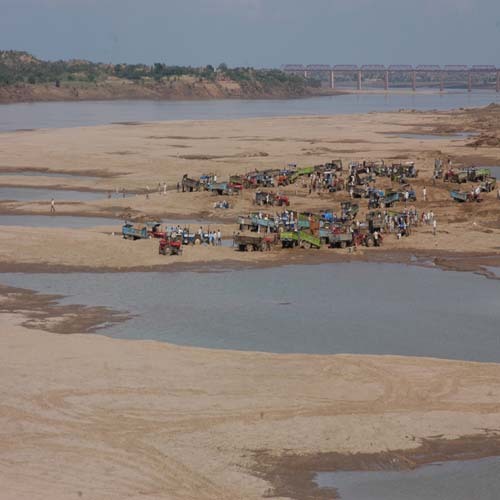 Construction of dams, barrages and canals that lead to an excessive irreversible loss of riverine habitat are also a problem for the gharial. Net fishing is another major threat to the population when Gharials become entangled in gill nets and drown or are killed by the fishermen. This article can also be read here and here.